Perhaps I’m worrying about nothing; so much of our world is basically mob mentality through and through, with herds of independent thinkers flocking from fad to fad. Rising above that is required for being a disciple of Christ. Perhaps you have another blog post on “whole body” type interdependence, to balance out that “ALONE”? Hi Luke! Thanks for reading and for the comment. 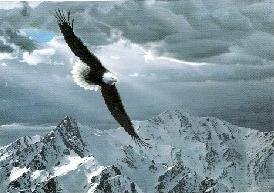 I am not at all discounting the importance and interdependence of the Body of Christ, but none of that matters if we are not first and foremost focused on God Himself — who He is, what He’s done for us, and who we are in Him, which I think the eagle metaphor demonstrates rather well. Also, as I mentioned in the post, this particular piece originally followed one I had done using the contrasting metaphor of prairie chickens where they are never alone, and everything is measured among themselves and by themselves, and much of what they do depends on their own strength and efforts, i.e., they must run about after bugs and such, peck at the ground, flap furiously to fly, etc. In any case, all metaphors/analogies break down somewhere and for the most part can be used only to illustrate a part of the whole… Which is what I was doing here. Makes sense! This reminds me of the Tower of Babel: people preferring to stick together and stay where it is safe, rather than go out and explore the wondrous reality God has made. Add to this a rootedness in God that is stronger than any other rootedness, and you get a particular kind of “ALONE”: one in which any and all humans can tell you you are wrong, without you immediately believing them. After all, the prophets in the OT sometimes had to be “ALONE”, lest they disbelieve the very words God was telling them! I am perhaps a little oversensitive to this “ALONE” business, given that I have been that for much of my life. God said it best: “It is not good for man to be alone.” Fortunately, I do have a wise, beautiful wife who introduced me to your Legends of the Guardian King. She and I half-enjoy and half-are-saddened by all the ‘Christian’ fiction out there which portrays Christianity as basically the book of Proverbs . This is terrific and timely AGAIN. And again and again.